MITUTOYO PH-350, 14” OPTICAL COMPARATOR W/DRO. CONTROL, COOL BLASTER, LIVE TOLS, 2Omm DIAM MAX, 12 FT CITIZEN CAV 20L-1S BAR FEED, S/N 215620/3295. COOL BLASTER, LIVE TOOLS, 20mm DIAM MAX, 12FT LNS BAR FEEDER, S/N QO936. HAAS 5C INDEX WITH SERVO CONTROL. COLLET NOSE, 6’’ CHUCK, 12 POS TURRET, S/N 529 AND 211. MITUTOYO PH-350, 14’’ OPTICAL COMPARTOR W/ DRO, S/N 60203. 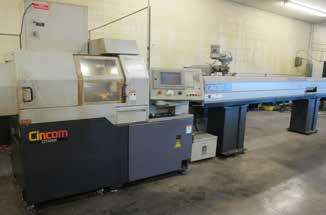 2003 B & S GAGE 2000 CMM, WITH TESA STAR PROBE, PRECISION. HEM MODEL 750A, AUTO HORIZONTAL BAND SAW, S/N 160381VB. JOHNSON GAGES, DELTRONICS, MICS, JOE BLOCKS, CALIPERS, ETC. LARGE SELECTION OF COLLETS, KURT VISES, END MILLS, CNC TOOL HOLDERS. CURTIS 5 HP AIR COMPRESSOR. GRIMMER SCHMIDT 10 HP AIR COMPRESSOR.